Stage Whispers: So, where are you from? There is something very, very special about being in the cast of Fiddler on the Roof. You could already see it in the first rehearsals of the fall, with a cast that is twice the size of last year's show. You can feel it in the intensity of the discussions about how certain scenes "should" be staged - many of us (at least those over 40!) have strong feelings about what does and doesn't belong in a scene of preparing for Shabbat, lighting the candles, or celebrating a wedding. And this time it isn't intellectual, or theoretical, or artistic - it's visceral, meaning you feel it in your kishkes.... this is how it SHOULD be. We know. We know. We saw it in our grandparents, and heard about it in the family stories told around the Passover table, and remember it from the old men who always came to the morning minyan at the shul. Being in this show does something to my awareness, my consciousness. In Tel Aviv a couple of weeks ago, went into a McDonald's (please don't tell anyone) and ordered an Egg McMuffin*. Bit into it and was transported back 35 years and 6,150 miles.... a taste of "the old country". Then started thinking about what that means, "the old country". And how my relatives must have felt, all those years ago, when they landed in the Goldineh Medinah - and left behind, forever, "the old country". What tastes, what smells, what images would have reminded them of what they left behind? How did it feel to them? Did they grow nostalgic, and long for "home", or were they glad to be out of there, and never looked back? That entire generation is gone now, and we didn't ask them when we had a chance, at least not in my family. Even more astounding, i never thought about it all these years - until here we are, standing in the cold with our bundles and our babies, singing goodby to Anatevka, sweet little village little town of mine. Another story: a couple of weekends ago, we all got up in the middle of the night and went out to Kibbutz Urim to film a video clip promo for the show. 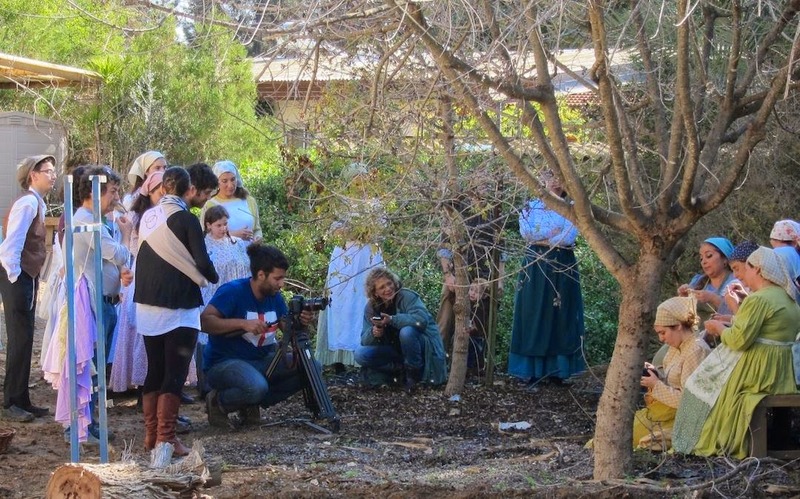 We found a spot in the kibbutz with trees and a wooden shed in the background, and spent several hours shooting the clip. There was one elderly gentleman who came out on his balcony when the music started, and spent most of the morning smoking a cigarette and watching us from above. He later told someone that when he looked out the window, and saw us all standing there in our costumes, he felt as though he had been transported back to his childhood.... the memories came flooding back. It is an honor and a privilege to be in this show, especially here in Israel. Home at last. Please come to see it, and be a part of it. Please bring your children and your grandchildren. Tell them, "This is about us, when we went forth out of there". * RELAX! There is no meat, let alone ham, in an Israeli MacMuffin!! !